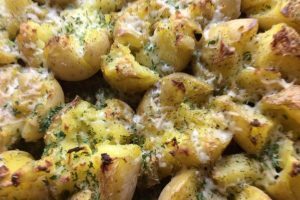 One of the many wonderful recipes this momma got from one of her daughters! 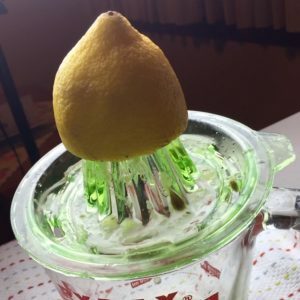 Both our girls are great cooks and each of them has shared some remarkable recipes with me. 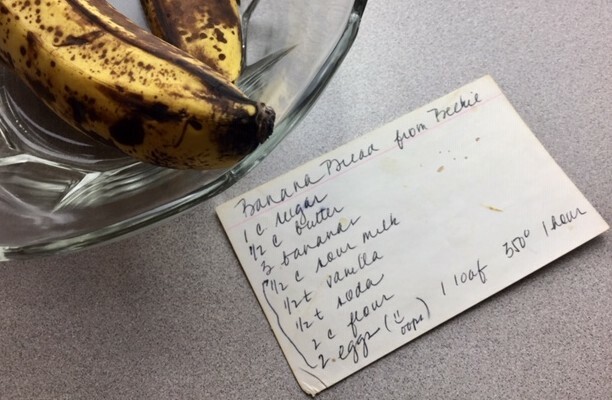 This is, hand-down, the best banana bread recipe I’ve ever tasted. The soured milk (note: not sour milk about to be dumped!) and the baking soda get all excited when they meet up and provide all the leavening the bread needs! The little hint of nutmeg and vanilla just push it over the top! When you add a shake of cinnamon sugar before you bake it, the crust takes on a beautiful golden color that’s very appealing and adds a little extra oomph! Confession: Sometimes I buy bananas just to watch them ripen for banana bread! 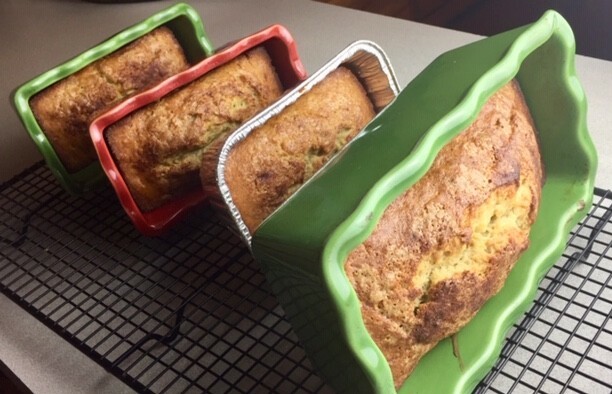 The secret to spectacular banana bread is optimum ripeness. Ok, ok, that’s pretty food nerdy. But it matters. When perfectly ripe, the peel should have lots of black spots. The peel can be almost completely black but the banana should still be somewhat firm. When the banana itself gets dark and mushy, it should be thrown away. If you don’t have three ripe ones, just peel what you have and pop them in freezer bags and freeze until you have enough for a loaf or two. Then defrost and use them. Be sure you use all the “banana liquer ” that forms when they thaw out! Beat butter and sugar together until creamy and well blended. Break banana into chunks and add to sugar/butter mixture. Blend til bananas are mashed. Add flour, soda, nutmeg, and salt alternately with soured milk. Add vanilla. Mix until smooth and all ingredients are combined. Put into a well greased 5″ x 9″ loaf pan, top with about a tablespoon of cinnamon sugar. Bake in 350 degree oven about 55 minutes or until toothpick comes out clean. 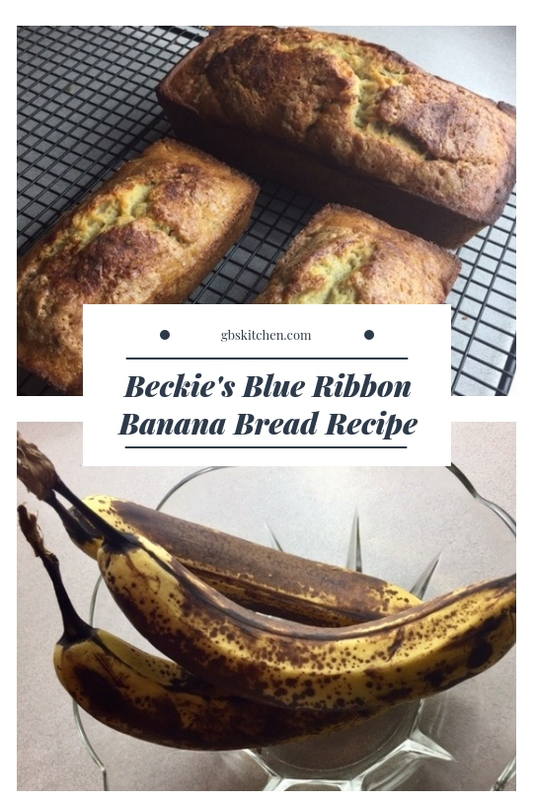 Beckie’s Blue Ribbon Banana Bread also makes the cutest little loaves, perfect for snacking or gifting. This recipe makes one 3.5″ x 7.5″ and three 3″ x 5.5″ mini loaves. Reduce baking time to about 40 minutes. *Some sources suggest the perfect ratio of cinnamon to sugar is 1/4 cup sugar to 1 Tbsp cinnamon. I say, follow your tastebuds! One big loaf or multiple mini loaves? It’s up to you! 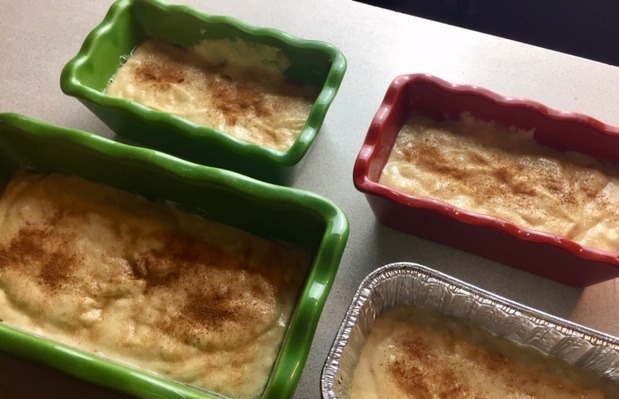 Let them cool on rack then pop them out, slice and wrap for a wonderful treat any time of day! Extra good with butter! 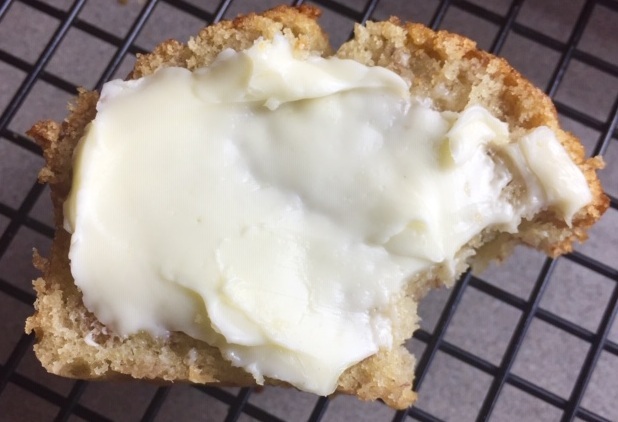 Here’s a four-bite mini slice with butter! Yum! Perfectly snack size and delicious! 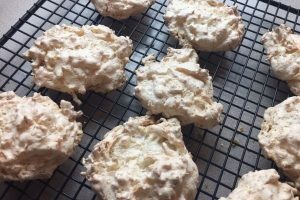 GB is what our six grandkids call me and I often bring a home baked treat to their ball games. 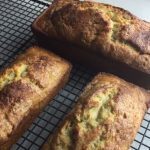 Banana bread is always a hit! 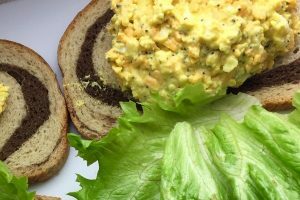 It’s wonderful for breakfast, too, and whipped cream cheese is another scrumptious way to top it! 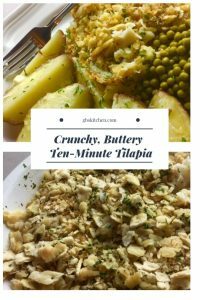 Previous Post: « How to Make Fabulous Fried Apples, a Versatile Side Dish! Well have to admit I’ve never tried it. You might do some label reading on Splenda or others you can bake with! I’ll bet you can figure out a way to do that!